How would you like an iPhone shaped like that? Until now it's mainly been Samsung beating the drum for oddly-shaped phone technology with its flexible displays, but Apple may soon join in if two recently unearthed patents are any indication. 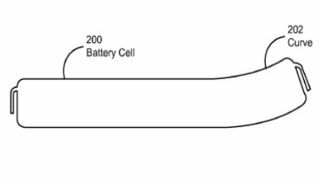 The Apple patents (1 and 2) in question are titled "curved battery cells for portable electronic devices" and "non-rectangular batteries for portable electronic devices, respectively. Unearthed by AppleInsider, the patent filings don't point to any specific technology or indicate any particular plans on Apple's part. Rather they simply hint at where Apple's design language might go in the future. The patents dug up today were filed in October 2011 and describe the processes by which curved and irregularly-shaped batteries might be designed and created. For the curved battery, a flexible pouch housing the battery's layers is exposed to pressure and heat in a process that could take up to four hours to set it into a curved shape. The patent claimed that the purpose of the curved battery can be "to facilitate efficient use of space inside a portable electronic device," though by the literal looks of things, the device itself could have an added curvature. The non-rectangular battery, on the other hand, can feature rounded corners and might fit more snugly inside a similarly shaped device (like an iPad). These two latest Apple patents are hardly the first patents to hint at where Apple's mind is wondering. As AppleInsider pointed out, these unique battery designs might even have something to do with a previous Apple patent for an iPhone with a wraparound display. That's pure speculation, of course, but it's interesting to consider how Apple might try to shake things up in a market increasingly filled with similar-looking devices.